A year after shutting down print, the British news site is finding that games are attracting more users. It has been a year since The Independent shuttered its print edition and became a digital-only publisher. Although it’s been a transitional year for the British news organization, the company said it is seeing a spike in readership, but not due to the content on its homepage. Rather, The Independent, owned by ESI Media, is attracting an additional 55,000 unique users and 186,000 more page views every month because of the games in the "Puzzles" section of its website. 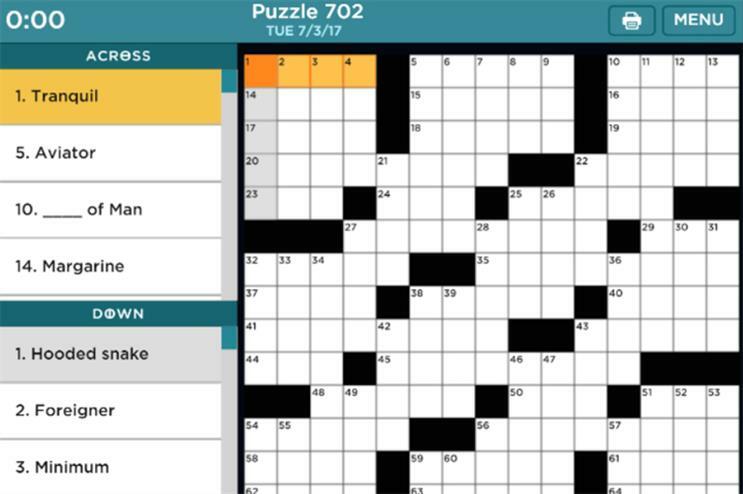 Games, like Sudoku, Mahjong and chess—but crosswords especially—have always been a major draw for readers of The Independent, according to Sam Stansfield, affiliate manager at the news site and operator of the "Puzzles" vertical. However, until a short time before its digital repositioning, the publisher, whose website had been operational since 1990's, only offered them in print. The Indepedent needed to find a way to bring the puzzles to its online readers. So, in June 2015—eight months before the end of its print edition—The Independent began working with Arkadium, a New York-based company that partners with publishers like the Washington Post, the Discovery Channel and USA Today to provide interactive content, such as games, to their sites. "It was really lucky we had the Arkadium site in place because otherwise, we would have had a lot of unhappy readers," said Stansfield. "When the paper shut, we saw a spike from all the readers that used to play the puzzles in the newspaper that wanted to carry on playing them." The publisher uses Arkadium's "Arena" platform to access more than 300 games, including card games like "Spider Solitaire" and BuzzFeed-style quizzes such as "Which Taylor Swift Song Are You?" It also produces four crosswords a week, which Arkadium optimizes for search. The crosswords created in-house account for 60 percent of the 'Puzzles' section's total monthly page views, according to Stansfield. And the 78 games Arkadium games on the site account for 30 percent. Users spend an average of 13.5 minutes on the site playing games, compared to the industry average of 3.8 minutes. And each game is holding user attention longer than the industry average bounce rate of 55.56 percent. The games only get an 11.46 percent bounce rate from users, according to the publication. The games draw a more dedicated user base since gamers regularly return to the site to find new games or access archived crossword puzzles, said Stansfield. The Independent has seen 56.5 percent of these gamers coming back to the site about 15 times a month, with 47 percent of these sessions taking place on mobile. "Games have been known to give people this stress relief," said Jess Rovello, CEO at Arkadium. "It’s a moment in the day where they can take a little time for themselves and not think about something terrible going on in the world. It’s a little mental break that very often becomes a nice daily routine for people." Rovello said the agency started seeing an uptick in publishers adding games into their sites around 2006. Since then, publishers have mostly remained quiet about the traffic they bring in. Although other Arkadium clients have seen success, The Independent is one of the first to reveal to the public just how many more users games bring to their site, said the agency. Even 30-second pre-roll ads don’t seem to deter the players. According to Arkadium, 90 percent of a publisher’s users will watch all the way through pre-roll ads to get to the content. "They're willing for that value exchange to take place in exchange for playing that awesome game," said Rovello. Still, Stansfield said the publisher plans to reduce the number of all ads on the "Puzzles" section of the site in the next six months. Ads, like the 30-second pre-roll ones that appear before the games, are a "necessary evil," he said. Without them, he admits, the site would not be sustainable. But they don’t do much to increase user satisfaction. "For those people, I just have to say, 'Look, bear with us, we're trying to reduce the number that we show, and show more effective premium advertising," he said. The publisher could switch to single sponsorships for the games and puzzles site, said Stansfield. Another option is a subscription model. "It's a work in progress," he said. One thing’s for sure: the games will be staying.